Two more cards using September release MFT products. For the first card I used Birthday Centre Pieces. To achieve the rainbow shadow on the birthday die, I cut it twice in white. On the lower panel, I coloured each letter with a copic marker and then glued them together slightly offset. I also used London Mouse, but I chose to go with a fall fair theme, and used one of the trees (and its matchind Die-namic) as cotton candy. I coloured the London Eye in rainbow colours and added some glossy accents. I left the stickles quite chunky on the 'cotton candy' for some fluffy texture. This is my final entry for the card design 'Superstar' contest that MFT is holding. I promise! The second card is very CAS, using Fall Florals (and matching Die-namics), Thanks So Very Much and a Double Stitched Square die, embossed onto the cardbase. I love the 'quilted' feeling it created! I filled in the flower centres with a black marker and some glossy accents. 2 cards so worth of super stardom...just like all the incredible cards you make! Brilliant cards. Love how you used the coloured layer under the white one. Two absolutely beauties! I am in love Ardyth! SuperStardom, here you come!! Ardyth, you are, and have always been a super-star! Darling - and mark my words: I will ride that London Eye one day!! You are a shoe in, these are fantastic!! Two more fabulous and creative cards! Your cards will have the judges asking if one person can win multiple times! Love your chunky stickles cotton candy and the clever use of a tree die to create this yummy treat! 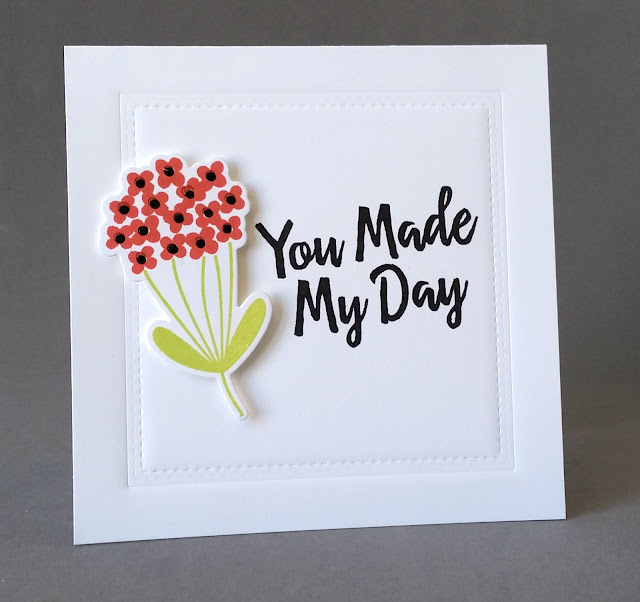 "You Made My Day" with this gorgeous CAS creation! Simple design, bold pops of color....DONE....perfect in every way! 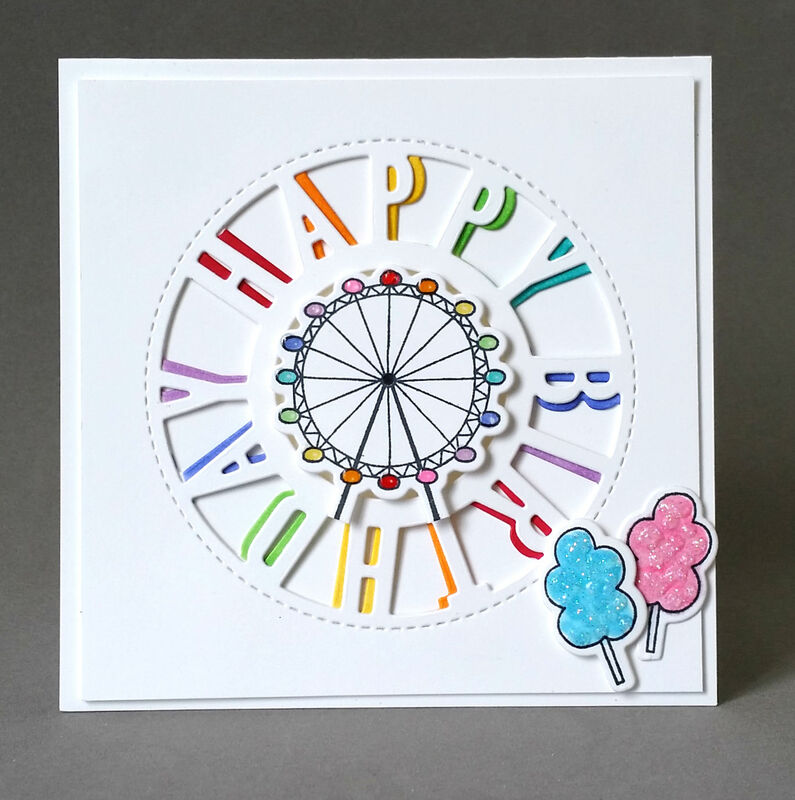 The pops of color in your happy birthday wheel really caught my eye! You are a design genius! Good luck with the superstar challenge. Wow, your fun ferris wheel card is especially great! Offsetting the letters really gives it a sense of movement. Good luck! This is fabulous, Ardyth! Good luck with the contest! Both cards are so creative and absolutely FABULOUS designs!!! Love them! Wow! That rainbow card will surely make you the superstar! At least if I had some say in it! Brilliant! Love the embossed frame on the second card! Your happy birthday card? Brilliant. Your second card is classy CAS. Talk about creativity, that birthday wheel is fantastic, Ardyth. And cotton candy? Who would have thought.